I just got back from a Dissertation Writing Retreat, put on by my undergraduate fellowship, Mellon Mays . Twelve of us planned our days, talked goals and schedules, and tried out techniques for staying productive and keeping up our morale. The first two days we were essentially locked in a room for four hours (two sessions of two hours each) and worked on our computers, using social pressure and a shared timer. Then we weaned off to one session and then no sessions, with the expectation that we’d figure out how to use the time schedule ourselves. The end of each day we had check-ins and discussed what worked and what didn’t. So I thought I’d share with you some of the stuff I learned. Write a task lisk for each day and focus only on those tasks. Make sure to “have a life,” which in my case meant starting a baking and math blog. Exercise! Figure out some way to move your body. Use SMART goals. Specific, measurable, attainable, realistic, and timely. I don’t really know what “attainable” means vs. “realistic” but maybe it balances out people with too low self confidence (at least it can be attainable) vs. people with too high self-confidence (remain realistic!). N years of grad school and those are the things I knew. I’ve been in a rough space for the past few months, math and life-wise, so this writing retreat was the perfect detox/jump start for me. Here are some things I learned! Break up goals into specific, manageable tasks. I used to look at my planner post-it each day and see things like “work on paper X” and “read paper Y.” On our first evening we listed our main goals for the week, and then took the top goal and split it into at least three specific tasks. So my “organize paper” became 1) copy topic sentences (lemma/theorem statements), 2) skim paper and name techniques, 3) figure out which theorems use which techniques, 4) form flowchart, and 5) rearrange paragraphs so flowchart makes sense. Then when I sat down the next morning I didn’t have “organize paper” to look at, but a really easy softball of a task to start my day and feel productive. Set out your tasks and goals the day before. This has helped me SO MUCH. I used to spend half an hour each morning reviewing the previous day and setting up what to do that day. Here’s a picture of the Emergent Task Planner pages we were using. Consider turning off the internet. I was always getting stuck on a thing, and then getting frustrated, and then checking slate or gawker or national review or reason or twitter or facebook and reading an article or five before going back to the task at hand. I’m pretty distraction-prone, so turning my computer to airplane mode and putting my phone away helped a lot during the retreat. In regular life I’ve been setting computer to airplane mode and putting my phone on a shelf after setting the timer (I still need to pick up if daycare or nanny calls). Keep a master task list for the project/week/month. We made an “activity inventory” of the larger goals we wanted to accomplish over the week. Then at the end of each day once I had finished my tasks for the day and was looking to the next day, I’d refer to the activity inventory and cross off the major goals and see what was coming up to break into tasks for the next day. Goals to finish this project, crossed off as I accomplished them. Or, funnily, — if they stopped being necessary. Various one-time techniques: pre-hindsight: think about a time you didn’t achieve a goal, and try to figure out what would have helped you achieve it. Then try to implement those tools for success in future goals. Put yourself first: spend the best part of the day (the time you’re most awake and aware) on the work that matters to you, and then deal with other peoples’ needs. Take breaks: “You don’t realize you need a break until you’re fatigued, and by the time you’re fatigued it’s too late (to do more good work”-Shanna Benjamin, our amazing facilitator. Good luck with all your work, blog readers! I think this is also useful for non-solo workers, but it’s harder to keep track of because there will be other people and other schedules involved. I did meet with a fellow grad student and we pom’d together, including a 25 minute conversation we had trying to figure something out. Good luck to all of us! It’s summer! Our local farmer’s market is teensy and the prices are about quadruple what I paid when I lived in Santa Barbara at a market about three times as large, but it’s still a good place to get incredible produce and goods that I can’t get elsewhere. On Sunday I picked up a big bag of cheese curds, some pork sausage, mizuna (YUM) and fresh asparagus. I don’t like asparagus. I didn’t grow up with it and it’s always sort of fibrous and stringy and makes my pee smell funny. 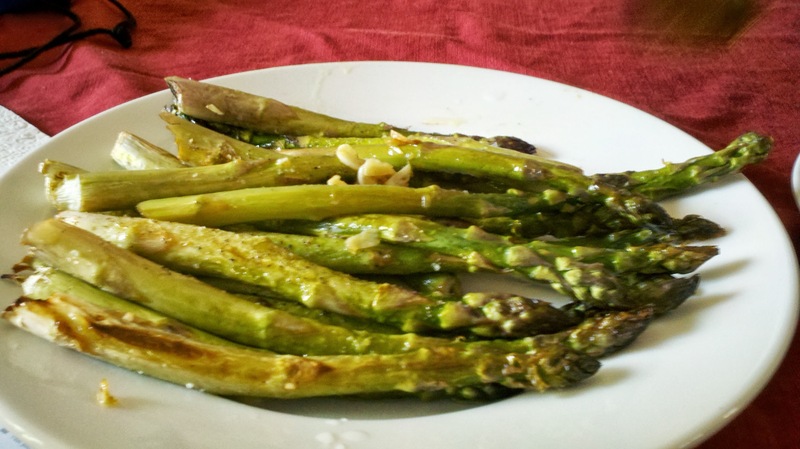 But holy cow this asparagus was incredible! Melty and tender in the middle of the thick stalks, with a pleasant bit of crispiness on the skinnier ends. And so easy to make! Then a squeeze of lemon and a generous pour of olive oil. 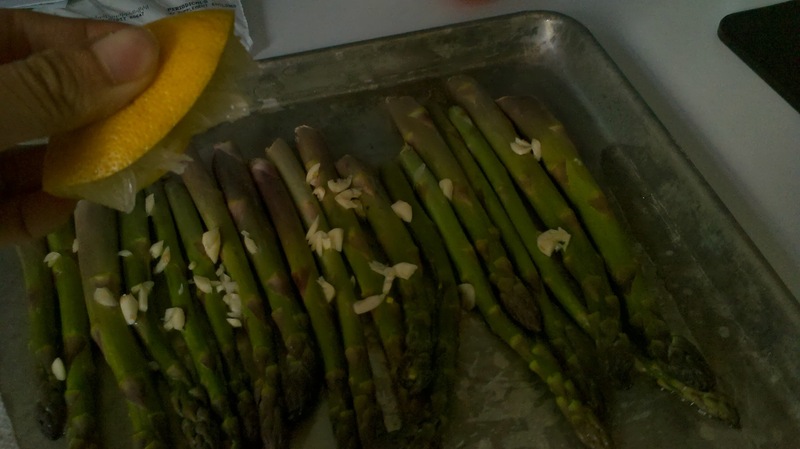 Roll the asparagus around in the oil on a baking tray/cookie sheet, and toss it in the oven. Let it roast for between 8 and 20 minutes (I did 14)- it depends on how crisp you like it. Pull it out and stick a fork in one and see if it gives (so is tender). Then sprinkle with salt and pepper and devour. 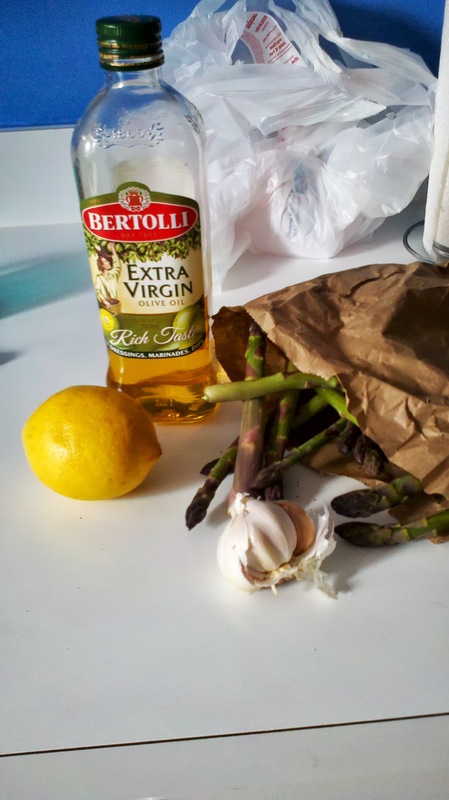 The garlic, lemon, olive oil, and salt play so well together. Next, HOW TO CUT AN ONION. It drives me nuts when people cut an onion crosswise: only do this if you are making onion rings or want grilled onion rings rather than delicious caramelized onion wedges in a pile atop your burger. 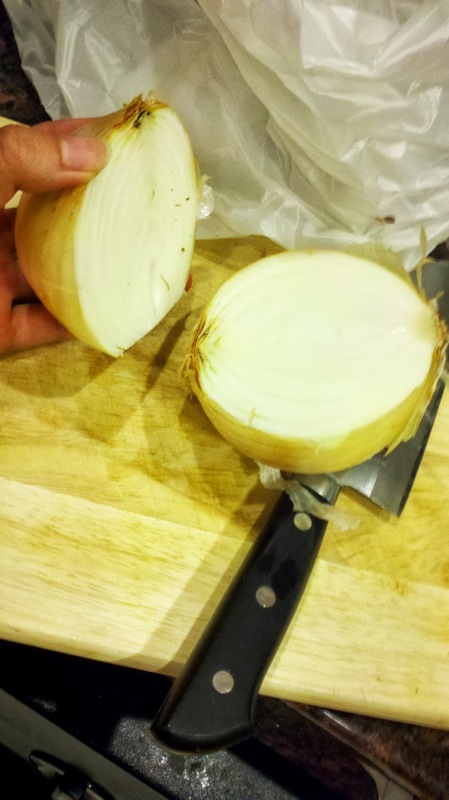 USE THE STRUCTURE OF THE ONION to aid your cutting: onions are partially pre-cut when you get them! 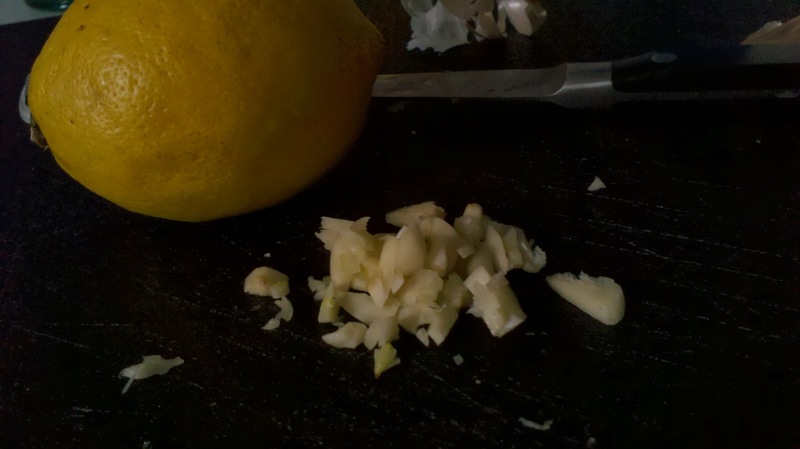 If you cut onions the wrong way, you’ll end up with awkward circular pieces and will have to move your knife in a weird circle to get dice that you want. I’m far from a precise and careful cook, but I know that if you want things to be cooked evenly, it helps to have them around the same size/shape. First, set your onion upright, with root on bottom and pointy Alfalfa thing on top. Halve it that way, so instead of rings you see a Georgia O’Keefe painting in the cross section. Then peel off the paper (or do this as a first step if you want) and lay a half down flat in front of you. 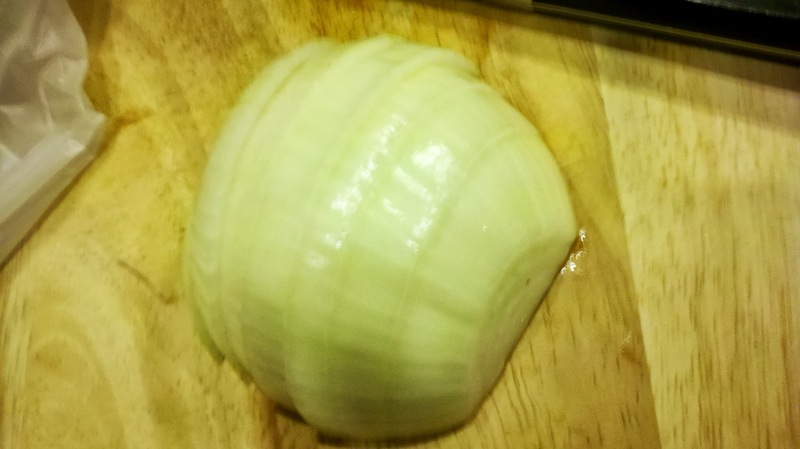 You now do a Cartesian grid cut on that, and you’ll get a nice dice from the layers of onion separating themselves. 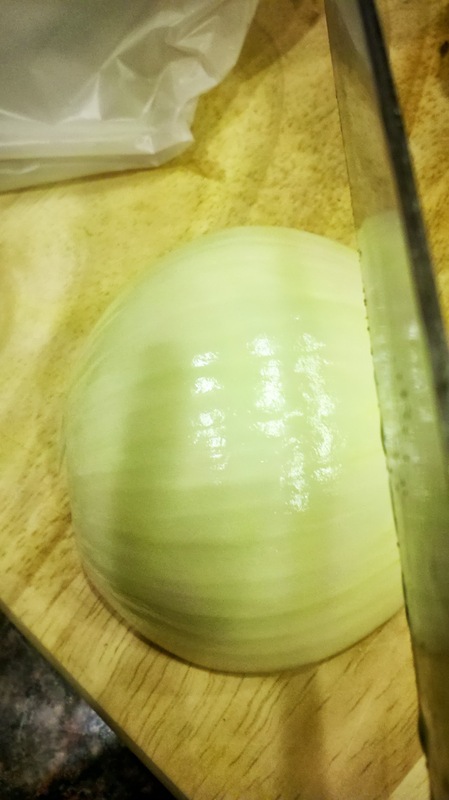 I like cutting “vertically” (parallel to the spine of the onion) first, then transverse to the layers, but either way works. In this photo I’m doing the transverse first. Step 2: Make a grid, it’s up to you! I was unwilling to take this photo myself so I’m glad it’s on the internet so I can show you. DON’T DO THIS. Notes on Combinatorial Group Theory by Charles Miller, available online and a pleasant read-on-your-own, graduate student level document, about 100 pages. A two week project for me while reading other things/relaxing for summer! I’m going to ask my advisor about a few parts I didn’t understand but overall I’d recommend for a short independent study. Lots of good exercises. A Primer on Mapping Class Groups, by Benson Farb and Dan Margalit, also available online but illegally? So you should just google it. This is an actual textbook, about 250 pages, much slower reading than the notes but still much more readable than most math texts. I’m reading this with my friends Ellie and Mike. I’ve actually attempted to read this before with the incredibly patient Jon McCammond and didn’t make too much progress. Second time’s the charm! Non-Positively Curved Cube Complexes by Henry Wilton-notes from a course he taught at Cal Tech in 2011. These are somewhere in between the first two in terms of difficulty- I’m definitely asking my advisor for help on lots of the material in this. Sort of a random post, but that’s me! Lately I’ve been thinking about failure a lot. I have my prelims coming up in a few weeks, and I’ve been anxious and fretful about failing them. Nothing bad really happens if I fail them. I’ll just have to study for them again, though that’s annoying- weeks spent trying to remember/relearn all the math I’m expected to know for a three hour exam (or two). The harder thing, harder than restudying and relearning (which is sort of fun), would be knowing that I failed. That there was an expectation for me, a line to cross to prove that I’ll be an okay mathematician, and I fell short of it. That I should have been able to do something, but I didn’t because I’m not quite good enough. This is pretty terrifying and terrible and there’s all sorts of stuff written out there about math anxiety. But here’s the thing: math is always like this. There’s always a quiz, or a homework problem, or a few minutes in a lecture, or a paper that you feel like you just don’t and can’t understand. Part of what’s so beautiful about math is that it’s really hard. And part of throwing yourself into your work (baking or math or whatever you do) is letting go of the fear that you won’t be good enough, that it’s too hard, that you aren’t up to the challenge. 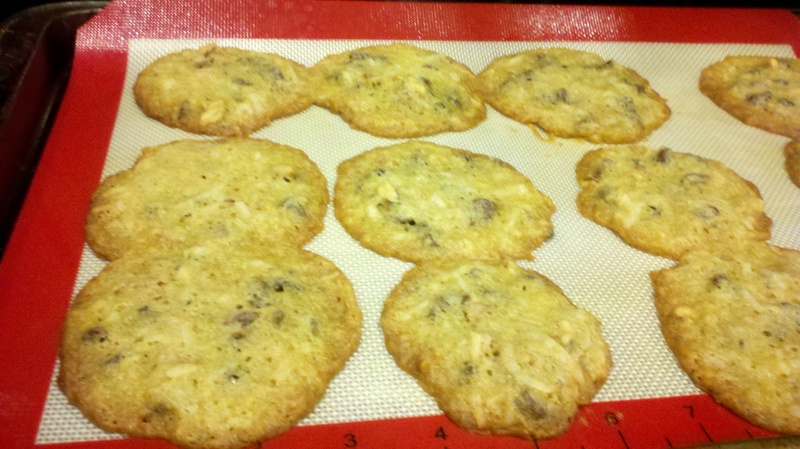 The cookies are flat, there’s big holes where the unincorporated baking soda lifted out of the cookie, there’s not enough flour to hold them together, and the edges taste like scrambled eggs (it’s gross). I bet one of these things has happened to you before, or you don’t bake, or you are lying, or you are my friend Edward. Nut another pun… these drive me coconuts! And then they come out and they’re awful. The humidity was off, my oven doesn’t work well, the baking soda is old: excuses in baking, perhaps, sound more rational when written than excuses in math (this is too hard, I hate math, I’m too stupid for this). But they’re still excuses, which are what we make when we fail. I’m human, I make mistakes, I fail sometimes. I make excuses. 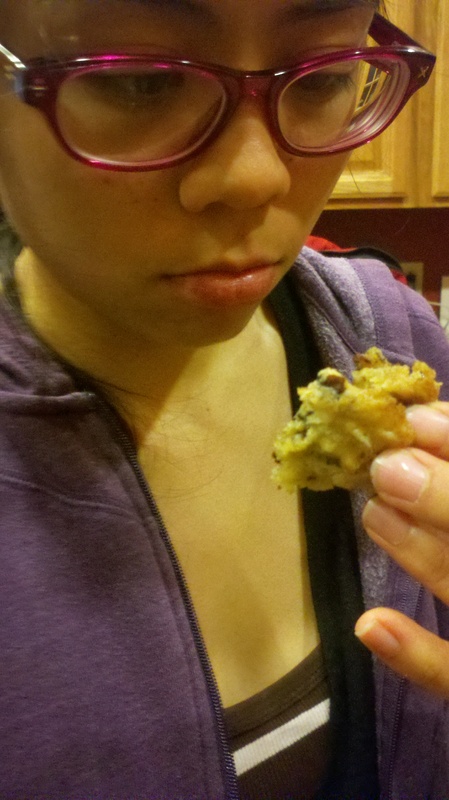 But I try to learn from my mistakes, and I’m going to make cookies again, and I’m going to keep doing math, and I’m going to fail again (hopefully not in a few weeks). And this is all okay. This is life! 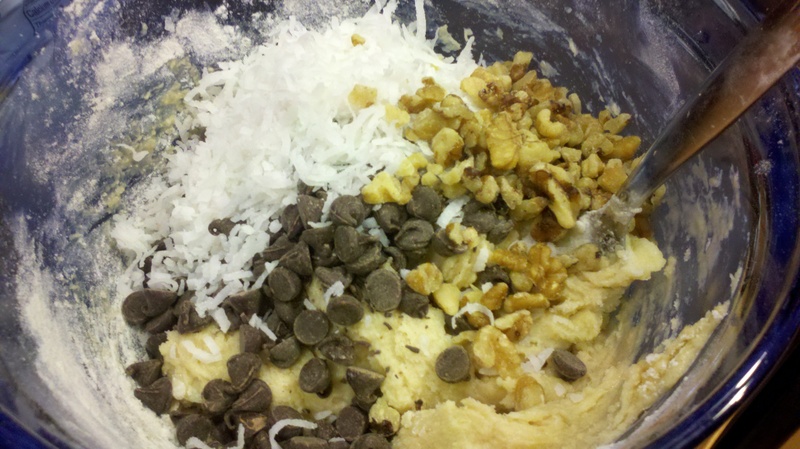 This is why this blog is about baking and math! 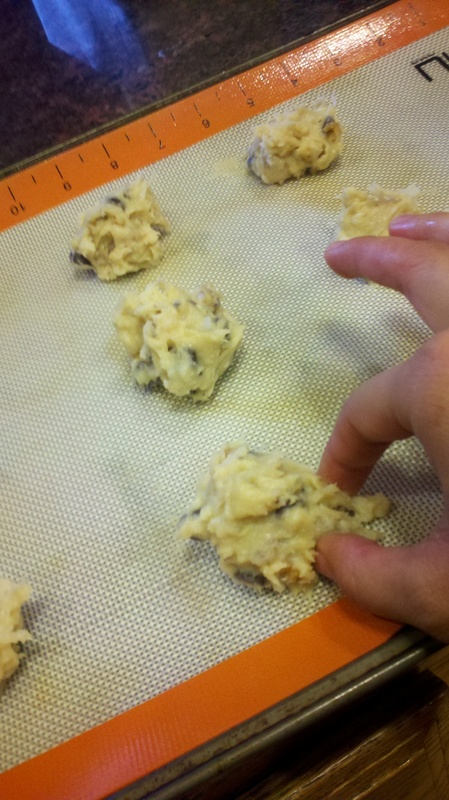 Drop by tablespoons onto your silpat or parchment paper or greased baking sheet, and bake at 375 (NOT 350) for 10 minutes.